Royal Dutch Shell says it's committed to the dividend, but it's getting harder to pay. Royal Dutch Shell (NYSE:RDS-A) (NYSE:RDS-B) has been hit just as hard by the oil industry downturn as any other oil major. So far, though, it's managed to keep its dividend intact. Still, the company's cash flow statement bears watching, because keeping that dividend going is getting harder to pull off. Here are two red flags to watch on Royal Dutch Shell's cash flow statement. Shell's earnings cratered following the mid-2014 oil price drop, going from around $3.00 a share in 2014 to just $0.60 or so last year. (Note that the U.S. traded ADRs represent two shares of Shell stock, so these figures and all of the other per share numbers in the text, which are based on one share of stock, may be half of what you expect to see if you own the ADR.) In the first quarter of this year, the integrated oil giant only earned about a dime a share. Clearly, things aren't going well for Shell's business right now. That's understandable, since oil and natural gas prices play a big part in the company's results, but there are implications to the bottom-line decline. RDS.B EPS Diluted (Quarterly) data by YCharts. For example, the company pays a $0.47 per share dividend every quarter. (The numbers in the graph above are for the US listed ADR and are, thus, twice the actual figures for a single Shell share.) 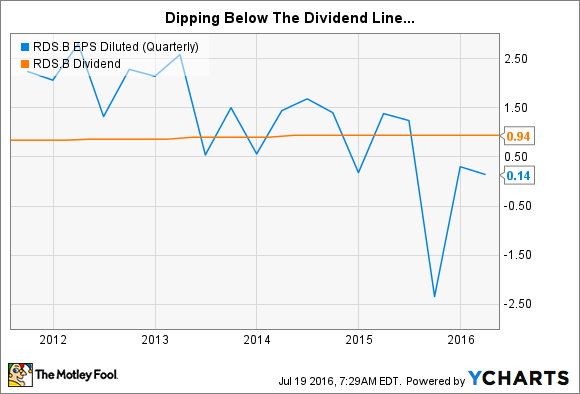 Do the math, and you can see that earnings don't cover the dividend -- and haven't for some time. No wonder Shell hasn't boosted its payout in over two years. For some investors, that's enough reason to avoid Shell. However, dividends don't come out of earnings, they come out of cash flow, which is why Shell has been able to continue paying so much and why, in late 2015, CEO Ben Van Beurden said the company would do what it needed to do to support the dividend. The first thing to notice is net cash from operating activities. In 2015, that figure was $29.8 billion, which is pretty substantial when looked at in isolation. But Shell spent a little over $26 billion on capital expenditures, like exploring for new oil and maintaining its existing fields. Dividend payments, meanwhile, totaled nearly $9.4 billion. Wait, that math doesn't work: 26 + 9.4 = 35.4, and that's larger than 29.8. That's red flag No. 1. Shell isn't covering its dividend and capital spending right now with cash flow from operations. It's worth noting that the company has a scrip dividend in place, which trades shares for cash, if an investors wishes. 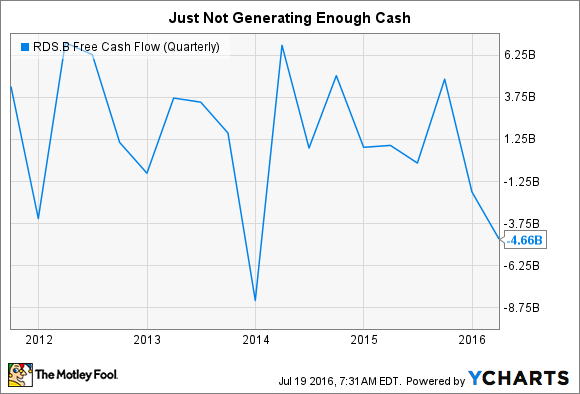 That saved the company around $1.5 billion in cash in the first quarter--but it doesn't change the bigger picture that there's a potential cash flow problem here... in some ways it just makes the issue more obvious. RDS.B Free Cash Flow (Quarterly) data by YCharts. This is where red flag No. 2 comes in: debt. That's how Shell is bridging the difference. In 2015, it raised around $15 billion in new debt (it issued $21.5 billion and paid off $6 billion). That's a lot more than it needed to cover the dividend because it was preparing for the $50 billion acquisition of natural gas-focused BG Group, which closed earlier this year. However, every time the company issued more debt than it pays down, its leverage increases. That can only go on so long before you'll need to start paying closer attention to the balance sheet, too. At the end of the first quarter, debt stood at a little under 30% of the capital structure. Not too bad, and the company paid off nearly $2 billion in debt while issuing only $250 million. So, no big debt worries yet and a little movement in a better direction. Unfortunately, first-quarter capital spending and dividend payments still dwarfed the cash generated from operating activities. To be fair to Shell, competitor ExxonMobil (NYSE:XOM) is in a similar boat. Net cash provided by operations basically covered the oil giant's capital spending in the first quarter. It had to issue debt to cover the dividend. But long-term debt is only about 15% of Exxon's capital structure. Shell has less wiggle room than Exxon. So, the big question for Royal Dutch Shell investors is whether or not the oil major can keep paying the dividend in the face of a steep industry downturn. Worryingly, it looks like there are two red Flags on Royal Dutch Shell's cash flow statement that suggest there's a lot of risk to that disbursement right now. First, it's paying out more for capital spending and dividends than it brings in the door. Second, debt is covering the divide, which can only go on for so long before there's trouble on the balance sheet, too. If you are an income-focused investor and own Shell, or if you're just are looking at it because of the fat yield, keep a wary eye on the cash flow statement. Although management has said it plans to keep paying the dividend, the cash flow statement is waving a couple of important red flags right now. That's not to say the dividend is about to be cut, only that there is a real risk that it might be if oil prices don't move higher quickly enough.